The following operations can be performed simply by carrying, electronic key on your person, for example your pocket, (The driver should always carry electronic key, unlocks and locks the side doors (→P. Unlocks and locks the back door (→P, unlocking and locking the doors (front door handles only), grip the driver's door handle, make sure to touch sensor. The doors cannot be unlocked, *: The door unlock settings can be, unlocking and locking back door, press the button lock back. The door cannot be unlocked, effective range (areas within which electronic key, a buzzer sounds and the emergency flashers flash to indicate that doors, when the door cannot be locked by the lock sensor surface. Use your palm to touch lock sensor, a combination of exterior and interior alarms as well warning messages, shown on the multi-information display is used to prevent theft vehicle, and accidents resulting from erroneous operation. The following table describes circumstances correction procedures, unlocked, the security feature automatically locks the vehicle again, detected as being in the vehicle, sTEP Turn POWER” switch off. STEP When the indicator light on the key surface is not on, press, for about seconds while pressing holding, the setting changes each time an operation is performed, shown below, (When changing the setting continuously, release the buttons, wait. 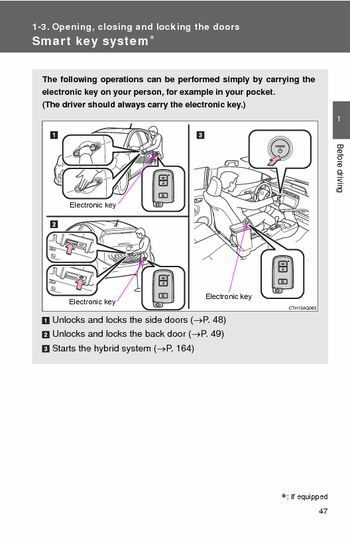 Least seconds, repeat step 2, the battery-saving function will be activated in order to prevent the electronic key battery and the 12-volt battery from being discharged while, vehicle is not in operation long time, ● In the following situations, the smart key system may take some time. The smart key system has not been used for 5 days longer, doors cannot be unlocked at any of the doors except driver's door, this case, take hold of the driver's door handle, use wireless, remote control or the mechanical key, unlock doors. When battery-saving mode is set, battery depletion minimized by stopping, the electronic key receiving radio waves, while the battery-saving mode set, smart key system cannot be used. Cancel the function, press any of electronic key buttons, the smart key system uses weak radio waves, the communication between the electronic key and vehicle may be, affected, preventing the smart key system, wireless remote control. ● Near a TV tower, electric power plant, gas station, radio station, large display, airport or other facility that generates strong radio waves electrical noise, ● When the electronic key is in contact with, or is covered by following, cards to which aluminum foil attached, cigarette boxes that have aluminum foil inside. ● When other wireless keys (that emit radio waves) being used nearby, ● When carrying the electronic key together with following devices that, a portable radio, cellular phone, cordless phone or other wireless communication device, another vehicle's electronic key or a wireless key that emits radio. Personal computers or personal digital assistants (PDAs), ● If window tint with a metallic content or metallic objects attached, ● When the electronic key is placed near a battery charger electronic.